The Formax Cut-True 22S Electric Paper Cutter is perfect for print shop and in-house print finishing. The 22S Electric Paper Cutter cuts stacks over an inch high and 16 inches wide. This semi-automatic cutter requires very little effort thanks to its electronically-controlled two-button operation. Calibrated scales and the LED laser helps ensure precision cutting. The electronically-controlled safety cover, safety lock with key, blade lock, and wooden paper push all help to ensure user safety. Plus, the 22S comes with a rugged metal stand for a stable work surface. This Formax Cut-True 22S Electric Paper Cutter is backed by a 90-Day product warranty. Check out more of its great features below! We can cut through huge stacks of paper with just the push of a button. It is easy to use, works great and saves us a ton of time. Wish the cutting width was about two inches wider for digital sheets. May need to upgrade to a larger machine someday. For now this one works great. I am looking for a cutter that make angle cuts. For instance, I need to make a 2 inch angle cut off the top left of 8 1/2 x 11 paper. Is this possible? And can it be done still using the safety guard? Thank you for your question. With the Formax Cut-True 22S 17" Electric Paper Cutter you are able to make angle cuts and you can do so with the safety case still attached to the machine. Is there any recommended monthly volumes on the amount of paper you can cut? Thank you for your question. Formax doesn't have a set duty rating for their cutters because there are too many variables. The Cut-True 22S Electric Paper Cutter is deigned for a commercial environment and can stand up to a high volume of use if well maintained. What is the shortest cut it will make? For example, could I trim 1/4" off of a paper? Thank you for your question. The Formax Cut-True 22S Electric Paper Cutter would be able to trim small amounts off of the edge of a page. To keep the cut clean you may need to reduce the number of sheets that you cut at a time if the amount you want to trim gets too small but it should not have any issue trimming a 1/4". Can it cut card stock pape? Thank you for your question. With the Formax Cut-True 22S Electric Paper Cutter you are able to cut through card stock. Because card stock can be denser than standard paper stock for the longevity of the machine you would want to cut a bit less of it at a time than paper. We frequently need to cut 12x18 size paper. 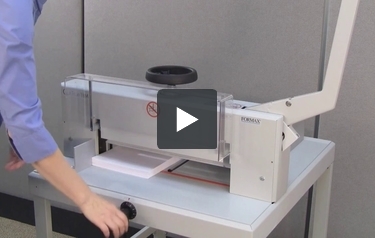 Will the Formax Cut-True 22S Electric Paper Cutter be able to handle that size paper? Thank you for your question. The Formax Cut-True 22S Electric Paper Cutter has a cut length of 16.9" so it would be able to cut across the 12" width of the page but not the 18" length.